Tarawangsa is a traditional, sacred music in West Java, Indonesia, which is played during the harvesting ceremony to welcome Dewi Sri (the Goddess of rice), while entertaining the community. Tarawangsa is played with a simple string instrument locked within 42 standard compositions. The performance with tarawangsa music can be played differently in various parts of West Java such as Sumedang, Tasikmalaya, Bandung and among the Baduy community in Banten., but always occur during the rice harvest ceremony. In each tarawangsa performance, there are two groups of songs with different functions, namely: (1) those performed specifically for ritual ceremonies; and (2) those for community’s entertainment. Tarawangsa music is learned by means of directly observing the guru (teacher) play, listening to, copying, and practicing it. Thus, there is no formal guidance. Everything is based on interpretation, both by the teachers and the students. There are fears that tarawangsa music may become extinct being highly dependent on the ritual ceremony, which today is less practiced. Among the causes for not holding the ritual ceremony is lack of funding, but more and more it is because of the fading of these cultural beliefs due to the increasing Islamization of society. In an effort to preserve this important cultural tradition, a group of three musicians has formed the group Tarawangsawelas to focus on performing Tarawangsa music. They will introduce it to SEA Junction audience on 17 September at 5PM – 6.30PM. Besides presenting the cultural context of Tawawang music they will perform both traditional and contemporary forms of various Tarawangsa compositions. 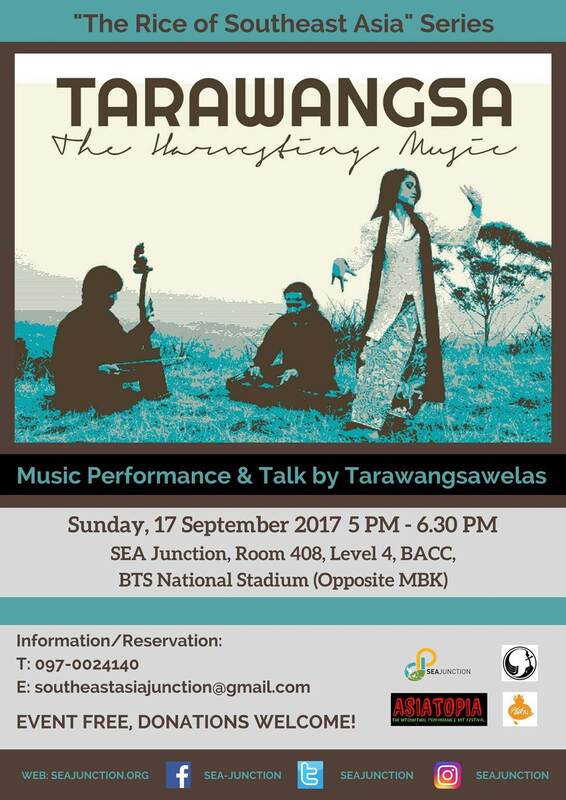 More particularly, Tarawangsawelas is composed of Teguh, Wisnu and Mina, all graduates from the Indonesian Art and Culture Institute (Institut Seni dan Budaya Indonesia) of Bandung, West Java, where they studied gamelan, classical and contemporary music. They learned to play the instrument traditionally, but they have also introduced contemporary elements to it. The group will hold a Europe Tour on November 2017, as part of Europalia Program in Belgium, the Netherlands, and Germany. Their first vinyl recording will be launched next November by Morphine Records (Germany). This event is the third of the series “The Rice of Southeast Asia”, which was launched in May at SEA Junction with a talk by Tongtham Natjumnong, editor of Siam Rat newspaper, historian, poet, and political commentator on the “Origin of Tai Ancient Culture”, followed by a talk last August by Jittima Pholsawek, who has studied rice culture in Thailand for many years to produce the TV series “Rice Tales” about local tales related to rice from ancient to contemporary times. The series organized by SEA Junction in collaboration with Asiatopia International Performance Art and E-Shann Way Magazine focuses on rice as a core element of Southeast Asian cultures. All dimensions of rice, from culture to science and agriculture are explored in a series of lectures, exhibitions and other events. NB: The event is free, but donations are most welcome.